Surface roughness is a measure of the topographic height variations of the surface. The roughness can arise from polishing marks, machining marks, marks left by rollers, dust or other particles and is basically shaped by the full history of the surface from the forming stages (casting, sintering, rolling, etc.) to the finishing processes. Rough surfaces are commonly divided into the subcategories of deterministic and random surfaces. Deterministic surfaces have a pre-scribed shape, usually of a simple form such as triangular, rectangular or sinusoidal and are as such easily implemented in surface modelling applications albeit perhaps lacking somewhat in realism. Random surfaces, on the other hand, are stochastic and a result of a random process (or several) and are usually characterized using terms from probability theory such as the height distribution function (hdf) or the statistical moments of mean, variance (or rms height [s]), skewness and kurtosis. The surface variation in the lateral directions are described by the autocovariance function (acf) which describes the covariance (correlation) of the surface with translationally shifted versions, where the correlation length (t) is the typical distance between two similar features (e.g. hills or valleys). For modelling and simulative purposes random rough surfaces with Gaussian statistics can be generated using a method outlined by Garcia and Stoll , where an uncorrelated distribution of surface points using a random number generator (i.e. white noise) is convolved with a Gaussian filter to achieve correlation. This convolution is most efficiently performed using the discrete Fast Fourier Transform (FFT) algorithm, which in MATLAB is based on the FFTW library . NEW! GUI for generation and analysis of 1D and 2D random rough surfaces. DESCRIPTION: GUI for generation and analysis of 1D and 2D (isotropic or non-isotropic) random rough surfaces with Gaussian hdf and Gaussian or exponential acf. INPUT: Surface points, length of surface, rms height, correlation length(s), hdf and acf. OUTPUT: Surface plots, hdf and acf, rms height and correlation length(s) with comparisons to model values. Options also exist for saving and loading surfaces. REQUIREMENTS: MATLAB, Statistics and Signal Processing Toolboxes. Figure 1: Screenshot of GUI, click thumbnail to open a larger version in a new window. DESCRIPTION: Random rough surface generator of one-dimensional profiles with Gaussian hdf and Gaussian acf. The Nyquist sampling theorem sets a lower limit of the sampling frequency (N/rL) of the surface. Use at least a sampling frequency > 2/cl to get the correct correlation length (cl) of the surface from the surface generation algorithm. To achieve adequate gaussian statistics use a ratio of surface length to correlation length rL/cl > ~500. You can always use the analysis code (see below) to verify the statistical quality of your surface profile. DESCRIPTION: Random rough surface generator of two-dimensional (isotropic and non-isotropic) square surfaces with Gaussian hdf and Gaussian acf. Again, the Nyquist sampling theorem sets a lower limit of the sample frequency of the surface to achieve the correct correlation length, see above (in this case the sampling frequency is referred to the sampling along one of the square sides of the surface). To achieve proper gaussian statistics in the 2D case use a ratio of surface length to correlation length rL/cl > ~70. Again, please use the analysis code to check the quality of your surface and verify that you got what you asked for. DESCRIPTION: Random rough surface generator of one-dimensional profiles with Gaussian hdf and exponential acf. DESCRIPTION: Random rough surface generator of two-dimensional (isotropic and non-isotropic) square surfaces with Gaussian hdf and exponential acf. Figure 2: MATLAB plots of Gaussian random rough surfaces generated. Left side: Surface profile using rsgeng1D. Right side: Two-dimensional surface using rsgeng2D. 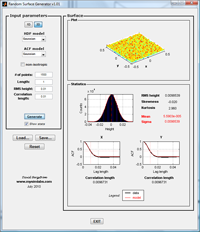 DESCRIPTION: Calculates the autocovariance function and correlation length of a 1D surface profile. DESCRIPTION: Calculates the autocovariance functions and correlation lengths (in x and y directions) of a 2D surface. DESCRIPTION: Calculates the height distribution function and the rms height of a 1D surface profile. 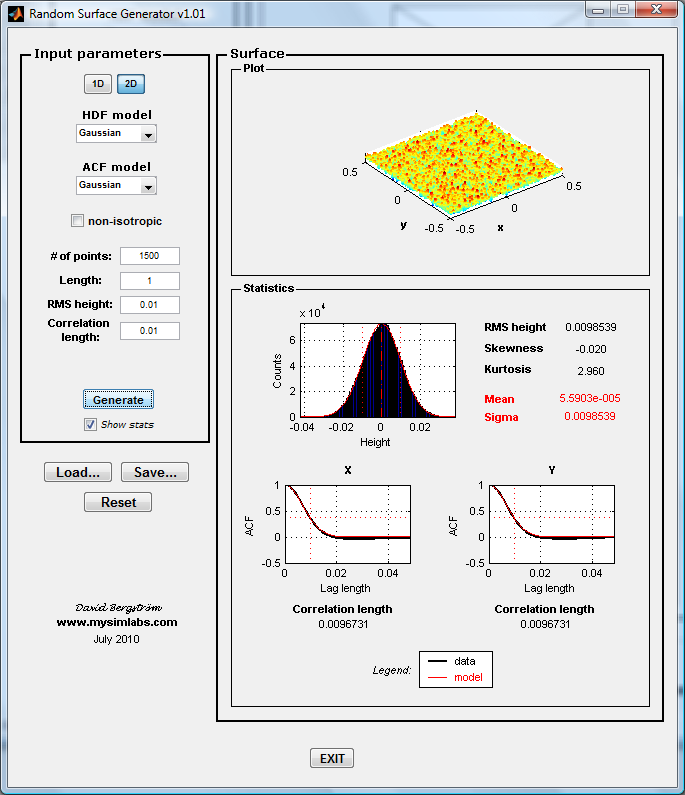 DESCRIPTION: Calculates the height distribution function and the rms height of a 2D surface. Figure 3: MATLAB plots of the normalized autocovariance function (left) and height distribution function (right) of a 1-d random rough surface profile with Gaussian statistics. Garcia, N.; Stoll, E.: "Monte Carlo Calculation of Electromagnetic-Wave Scattering from Random Rough Surfaces", Physical Review Letters, Volume 52, Issue 20, pp. 1798-1801 (1984). FFTW library - free collection of fast C routines for computing discrete Fast Fourier Transforms. Developed at MIT by Matteo Frigo and Steven G. Johnson. This page was last updated on February 26, 2012 14:04.